My husband and I believe that Whippets are the best kept secret of the dog world. We live in northern Ontario, between Sudbury and North Bay. Shetara is having a great start to the 2018 dog show season! 4 Best Baby Puppy In Show wins! GCH Shetara’s She Smiles Sweetly RN CGN, congratulations Carolyn and Fleur. 4 titles by the age of 14 months old. We have a brand new Champion at 7 months old! Congratulations Laurie Isaacs and Pink, accomplishing your 13th title! We have a foundation of beautiful champion females that are line bred to the great BIS SBIS AM.CAN.FIN.NOR.SWED. CH SPORTINGFIELDS JAZZ FEST, SC, FCh, ROMX! We bought our first two Whippet Women at the same time. CH DRAGONSONG’S WILLOW and CH DRAGONSONG’S DOMINO. In just a few summer shows both were conformation Champions! 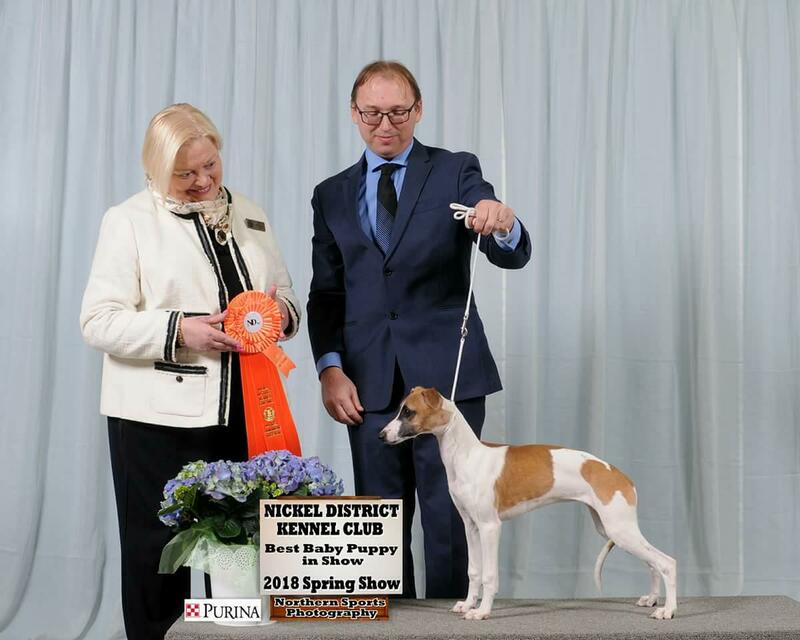 Then we got the call…a beautiful female pup was available out of CH DRAGONSONG’S MADISON AVE, she was the Best In Specialty Show winner at the Canadian National Whippet Club show. How could we say no! That’s when Harmony came into our life, one of the best decisions we have ever made. BPIS CH DRAGONSONG’S WHO’S THAT GIRL is a winner in every since of the word including bringing home (hound) Group 1st. Even as a puppy she was winning Best of Breed and beating Whippets that were already Champions! Harmony won BEST PUPPY IN SHOW!! One of those moments in my life that I will never forget. A few years later Harmony’s daughter also won Best Puppy In Show. That is Grand Champion Shetara’s A Star Is Born, Nova. After a few years of showing we knew we needed to bring a male into our life. Our good fortune continued when Jody Garcini offered us a male puppy. That’s when CH WENRICK’S REBEL WITHOUT A CAUSE, (James Dean) came to our home all the way from Indiana as our foundation stud dog. This awesome combination of renown kennels has produced conformation Champions and three Grand Champions! Also 2 more Best Puppy In Show winners! We are so proud of our last litter! 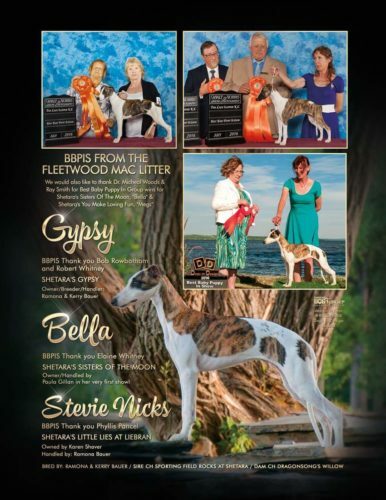 See our ad in the September issue of Canadian Dog Fancier! When you take home one of our pups we encourage you to stay in touch. Most of our previous puppy people can be found on our Facebook page..Shetara Bauer. Send us a friend request and you can chat with some of our puppy people there too! 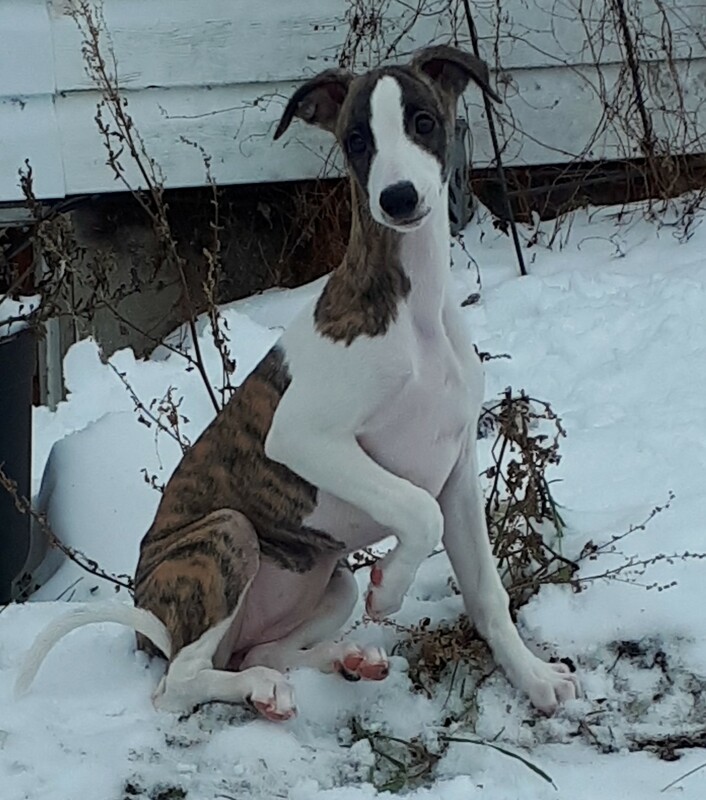 We will remain available to support you in any way that we can so that your life with our Whippet puppy is rich and rewarding…a love to last a life time. We have ‘no questions asked’ policy so that if for any reason you can no longer take care of your Whippet we will take it back and find a new qualified home for him or her. We will also help you if you wish to show your Whippet or we will show your Whippet for you!